Mexican troops in the wrong, fortunately no one was hurt. Actress and self-described “climate change activist” Emma Thompson flew from Los Angeles to London — some 5,400 miles — to give an impassioned speech on climate change at an Extinction Rebellion protest. Ironically, the famed actress railed against the “hypocrisy” of her government concerning climate change while at the protest, fresh off her long flight to London. And adding insult to injury, the protest announced plans to block flights out of a major airport on the day Thompson arrived. “I absolutely wanted to be arrested on my 60th birthday but I didn’t quite manage that. I’m so proud and thrilled to be part of Extinction Rebellion,” the actress said. “A representative of Dame Emma said she needed to take the 5,400-mile flight home to London after working in LA,” the report said. Ironically, young people attending the protest announced plans to target the Heathrow Airport because “air travel is so damaging to the environment,” Sky News reported. NY Times finally catching up to the truth. But there are a lot still not getting it, even now. A New York Times report about the Steele dossier has torpedoed many of the talking points that were used as reasons to launch a special counsel investigation, and many claims made in the past couple of years are aging badly, as Brit Hume noted. He may just be a bit concerned. According to the Washington Free Beacon, for some inexplicable reason, the journalistic outlet to rival all other outlets – The New York Times – reported that the “body of Christ” saved from the flaming Notre Dame cathedral earlier this week was a statue, even though no other media outlet reported it as such, and even though the most rudimentary understanding of Catholicism would lead one to conclude the term “body of Christ” does not refer to a statue. 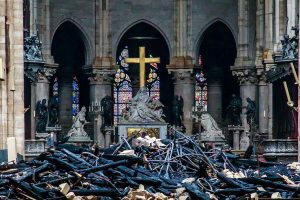 As the chaplain began removing a statue of Jesus, he said, his colleagues were fighting the fire from the cathedral’s towers. The flames had started to threaten the wooden structure around the belfry — putting the whole cathedral at even greater risk. With the statue in hand, Father Fournier, alone in the nave, gave a benediction to the cathedral, he said. Catholic doctrine states that the wafer and wine become the literal body and blood of Jesus Christ when a priest consecrates it while still retaining its original form – a process known as transubstantiation. No obstruction, no overt act and no underlying crime to obstruct. Some of the many they got wrong. Special counsel Robert Mueller’s report on Russian meddling revealed a string of anonymously-sourced stories about the investigation were inaccurate. 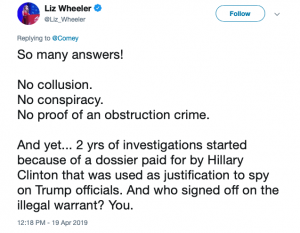 BuzzFeed and McClatchy each added editor’s notes to two stories following the publication of the Mueller report, which also contradicted an explosive CNN report and called into further question a bombshell story in The Guardian. The Mueller report directly contradicted a Jan. 18 BuzzFeed story alleging that Mueller had evidence President Donald Trump ordered Michael Cohen, his former attorney, to lie to Congress about his exploration of a potential Trump Tower Moscow deal in 2016. A June 2018 BuzzFeed story fingered former Russian Olympic weightlifter Dmitry Klokov as a potential go-between for Trump and Russian President Vladimir Putin. And this is why Americans don’t trust media. His TDS means anything done by a Democrat is cool. And he postures as an “objective” reporter. 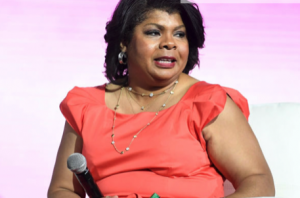 CNN analyst and American Urban Radio Networks White House correspondent April Ryan said Thursday that White House Press Secretary Sarah Sanders has to be fired, claiming the press secretary lied to the American people concerning the Russia probe. 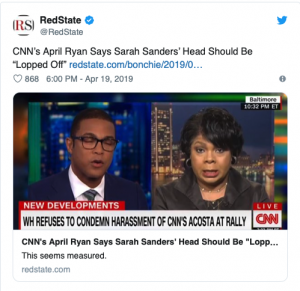 Ryan, appearing emotionally distraught and angry, also suggested to CNN host Erin Burnett that Sanders is in-part responsible for threats she and her colleagues in the media have faced. Sanders addressed the discrepancy on ABC’s “Good Morning America” on Friday. “It was the heat of the moment, meaning that it wasn’t a scripted talking point. I’m sorry that I wasn’t a robot like the Democratic Party,” the press secretary told George Stephanopoulos. All because of Democrats, who claim they care about kids. YUMA, Ariz. — Congressional Republicans who toured part of the southern border this week saw first-hand the number of families and children. 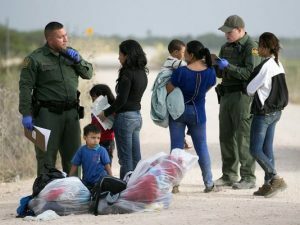 But the House lawmakers were shocked at the idea that smugglers recycle children across the border. “I think the entire delegation was shocked,” said Luke Ball, press secretary for Rep. Matt Gaetz, R-Fla. 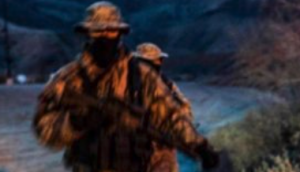 The Washington Examiner was riding along with Reps. John Joyce of Pennsylvania, Pete Stauber of Minnesota, Dusty Johnson of South Dakota, Andy Biggs of Arizona, and Gaetz Tuesday night when officials leading the tour pointed to a group of more than 40 people who had just crossed through the Colorado River south of the Morelos Dam and surrendered to Border Patrol agents less than a quarter-mile into the U.S.
“Right now, they’re getting their biographical information: name, first name, last name, date of birth, nationality. Right now, they may ask them where they’re going — how many people, if it was a family unit, were they by themselves, were they minors?” an agent, who spoke on background, told the group of lawmakers. 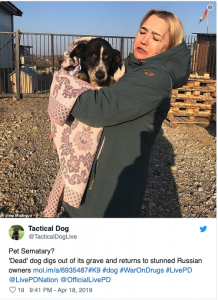 In headlines that mirror a horror flick, an elderly dog in Russia recently shocked its owners when it returned from the grave, alive and well, after being accidentally buried alive. Two sisters in the village of Novonikolsk, Primorsky Krai, recently buried their 18-year-old dog named Dik after he remained motionless “for a long time,” apparently having passed away in his sleep, International Business Times reports. The heartbroken owners took the pooch to a local pet cemetery and said what they thought would be goodbye forever — but Dik had other plans. Reportedly laid to rest in a shallow grave, Dik was able to dig himself out of the earth, and was soon found “exhausted” on the side of a road by passersby. The rescuers took the pup to Otkroi Svoe Serdtse (Open Your Heart) animal shelter, where officials shared photos of the lost dog to social media, according to The Daily Mirror. Catching wind of the news, Dik’s overwhelmed owners were able to retrieve him again. Media were more upset over Sarah Sanders ‘lie’ (saying there were countless FBI people) than their own two-plus years of false stories. Reporting done previously by The Daily Caller confirmed White House press secretary Sarah Huckabee Sanders’ claim that some FBI agents were indeed unhappy with former FBI Director James Comey’s leadership. 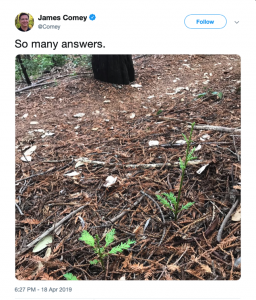 The Caller reported in October 2016 that FBI agents lost confidence in Comey after seeing how the bureau handled the investigation into former Secretary of State Hillary Clinton’s emails. But since the release of the Mueller report, media outlets have pounced on Sanders for saying that FBI agents had issues with Comey. 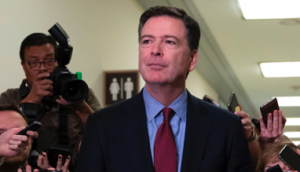 USA Today reported Thursday the Mueller report notes that Sanders told reporters on May 10, 2017 that Comey had been terminated from his post because he had lost the confidence of President Donald Trump, the Department of Justice and members of both parties in Congress. The Mueller report proved several media stories false, this included. One day after U.S. Attorney General Bill Barr publicly released a redacted version of the Mueller report, which concluded that there was no collusion between the Trump campaign and the Russian government to rig the 2016 presidential election, Buzzfeed is finally admitting its earlier reporting that Trump had “directed” his former attorney, Michael Cohen, to lie to Congress about a building project in Moscow was…well, complete crap. First reported in January, Buzzfeed’s “bombshell” story was fawned over by the liberal media…for about 24 hours. 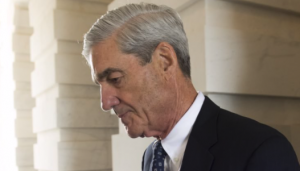 Shortly after Buzzfeed published the damning accusations, the Mueller team, in a rare break from their historically stoic silence, stated that Buzzfeed’s report was totally false. The publication stood behind their reporting, though – until Friday, when the outlet published a “note” at the top of its original report admitting that its earlier report was factually wrong. It’s a high crime and misdemeanor that anyone voted for these three. Determined to ignore House Speaker Nancy Pelosi, who said in March that she had no interest in attempting to impeach President Trump, the three freshman Congresswomen who have established themselves as the loudest members of the Democratic Party sallied forth yet again on Thursday, reacting to the release of special counsel Robert Mueller’s report by demanding the impeachment of the president. He has a very active delusion about passive collusion. In part, likely because of his role in pushing the lie. 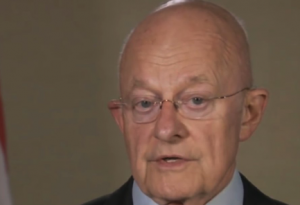 Clapper suggested Thursday that candidate Trump was perhaps “unwittingly” advancing Russian interference in the 2016 presidential election, in a CNN interview reported by Fox News. 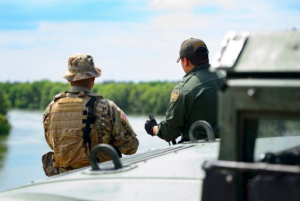 They’re upset about these guys, but not the illegal aliens, the drugs or the cartels that these folks have to deal with crossing their lands. Saying “I want to fire Mueller” is also not obstruction when there’s no overt action to actually do the firing or actually interfere in the case. Now that the Mueller report has been released, the spin game begins. Each side has been given sufficient material in the report to claim victory and to attack the other side. President Trump has said this was a good day. And it was, from a legal point of view. The report concluded that there is absolutely no evidence that anyone in his campaign (or any other American) illegally conspired with Russian operatives who were determined to try to influence the outcome of the election. That is the good news for Trump. It vindicates him legally on his claim from Day One that there was no collusion. The bad news is that the report contains information – much of which has been disputed by the Trump legal team – of non-criminal, but not very nice, behavior on the part of the president and some of his associates. Such conduct includes repeated misstatements about who knew what regarding meetings and other contacts. On balance, however, President Trump comes out way ahead on the Russia collusion issue. Putting aside legalisms, it really appears as if there was no actual collusion. On the obstruction issue, the bad news for President Trump may exceed the good news. Although the report “does not conclude that the President committed a crime,” as it states, it also refuses to “exonerate him.” Already, Democrats are arguing that Congress can revisit the obstruction evidence and come to its own conclusions about whether President Trump’s conduct constituted obstruction of justice. The catalogue of ten instances of possible obstruction provide a roadmap for Congress to further investigate, even if in the end it decides not to impeach. Attorney General William Barr and special counsel Robert Muller apparently have a fundamental disagreement over whether a president can be charged with obstruction of justice if he merely engaged in an act authorized by the Constitution but with an improper motive. 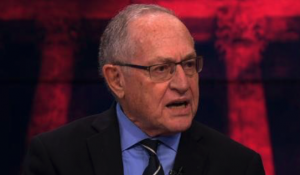 Barr takes the view – a view that I have argued for many months – that the act requirement of a crime (actus reus) cannot be satisfied by a constitutionally authorized action of the president, such as firing FBI Director James Comey. Mueller takes the view that a constitutionally authorized act can be turned into a crime if it is improperly motivated. The funniest thing about this? He’s teaching in England, most of these people who are so “pained” aren’t even going to be there, they’ll still be in Virginia. But the pain is still just too much. Earlier this month, triggered students at GMU demanded that Kavanaugh be removed from the faculty despite his class being taught in Runnymede, England — where the Magna Carta was signed. The students argued that women would be deeply harmed by Kavanaugh’s presence among the faculty due to the sexual assault allegation brought against him by Christine Blasey Ford without corroborating evidence during his confirmation hearing. “The hiring of Kavanaugh threatens the mental well-being of all survivors on this campus,” a female student told The College Fix at the time. 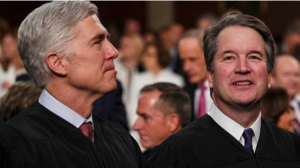 According to HuffPost, GMU president Angel Cabrera told students that while he understands they are upset about Kavanaugh’s hiring, the university will not reverse course. “Even if the outcome is painful, what’s at stake is very, very important for the integrity of the university,” Cabrera said during a two-hour town hall, prompting gasps from the audience. “Oh, my God,” one female student gasped in response to the news. Students have been fighting hard to get Kavanaugh kicked off the faculty and his three-year teaching contract terminated.